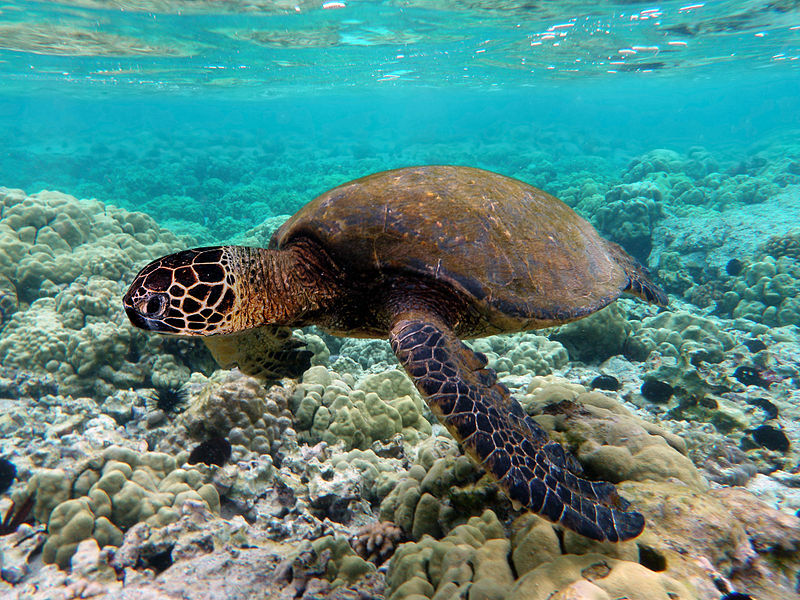 Facts: Green Sea turtles are the largest of all hard-shelled turtles. Babies are born to be about 2 inches long, while fully grown adults can grow to be about 3 feet long and weight around 350 pounds. What gives these turtles their name "Green", is because of their diet. Not like other sea turtles, the Green Sea turtles are herbivorous, feeding mainly on sea grasses and algae. One of the biggest reason that these turtles have become endangered is because of commercial harvest for their eggs and meat. Another big reason for the decline in population is that these turtles may suffer from a disease called Fibropapillomatosis. This disease is characterized by the multiple tumors on the skin and in the internal organs. These tumors interfere with breathing, swimming, vision, and reproduction. Lastly, another reason for there decline in population is degradation.